Established in September 1976, Mandarin Oriental, Manila is a deluxe hotel operated by the Mandarin Oriental Hotel Group, which owns and operates some of the world’s finest and internationally awarded deluxe and first class hotels and resorts. Mandarin Oriental, Manila’s commitment to deliver consistent and distinctive personal service has allowed it to gain international recognition. It is widely known as the country’s premier businessman’s hotel. The hotel is a luxurious urban retreat, located right at the heart of the Makati City’s central business district. Its commitment to completely satisfy and delight its guests is reflected in the hotel’s various restaurants and bars, which provide a wide range of gastronomic choices and top rate entertainment. Warm and efficient service, and an award winning culinary team, has helped Mandarin Oriental make its mark among connoisseurs. Mandarin Oriental, Manila boasts of 442 spacious and well-appointed rooms, including 89 Club rooms with exclusive access to the Club Lounge, and 19 suites on the highest levels of the hotel. Mandarin Oriental’s rooms and suites feature a residential feel. The guestrooms exude soft welcoming hues and the suites proffer a spacious feel of contemporary chic. Each of the hotel’s 442 guestrooms and suites offers efficiency and elegance with easy operation soft-touch bedside controls for mood lights, television and music channels, built-in safe and a ving card door lock system. In-room amenities include coffee and tea-making facilities. Additional amenities are offered to guests of Mandarin Oriental Club. Mandarin Oriental, Manila’s restaurants are renowned for their fine cuisines and exemplary service: Paseo Uno, popular for its dazzling interiors and superb buffets featuring Asian and International specialities prepared a la minute in open kitchens, The Tivoli for contemporary continental cuisine in a casually elegant setting, and the Tin Hau Chinese restaurant, with an ambience reminiscent of an elegant Chinese home, and renowned for its regional specialities and frequent food promotions. Martinis, the city’s most exciting smoking bar where the hottest local jazz acts take centre stage, features a wide selection of martinis, cocktails, premium spirits, and bar tidbits. MO Lounge, meanwhile, is a perfect meeting place for talking shop during the day and through early evenings when live piano music wafts in the background. The hotel offers banquet and conference facilities to meet every businessman’s needs. The hotel’s dedicated team of experienced banquets and events managers, chefs, and service staff can custom plan any type of event with international menus and themes. With 15 function rooms that can accommodate parties of up to 1,000 persons, the hotel can provide space for anything from meetings to lavish formal events. The hotel also offers outside catering services. Click here for the Map and Directions for the Hotel. The Philippines, officially known as the Republic of the Philippines, is a country in SouthEast Asia in the western Pacific Ocean. The Philippines is composed of 7,107 islands and is categorized broadly into three main geographical divisions: Luzon, Visayas, and Mindanao. 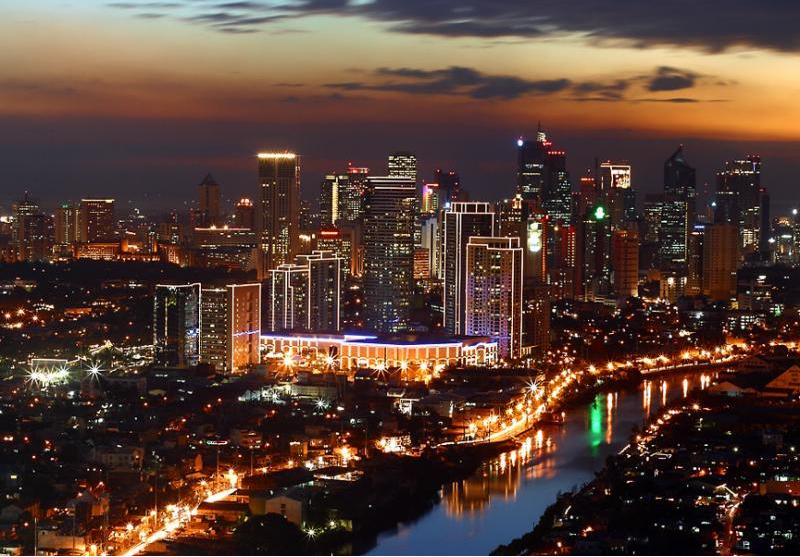 The capital city Manila lies in the Luzon region of the country. To its north across the Luzon Strait lies Taiwan. West across the South China Sea lies Vietnam. It is bounded on the east by the Philippine Sea. Filipino is commonly used being the national language. English is also widely spoken as second language for commercial and legal translation. Both Filipino and English are used in government, education, print, broadcast media, and business. The city of Makati features a tropical monsoon climate. Its proximity to the equator means that the temperature range is very small, rarely going lower than 20 °C (68 °F) and going higher than 38 °C (100 °F). However, humidity levels are usually very high which makes it feel much warmer. The summer monsoon brings heavy rains to most of the places from May to October, whereas the winter monsoon brings cooler and drier air from December to February. Manila and most of the lowland areas are hot and dusty from March to May. The City of Makati is one of the 16 cities that make up Metro Manila, one of the most popular cities in the world. Makati is the financial center of the Philippines and one of the major financial, commercial and economic hubs in Asia. It is an important center for international affairs. Makati is noted for its highly cosmopolitan culture, also being a major cultural and entertainment hub in Metro Manila. Metro Manila is one of the most vibrant cities in Asia and it offers a diverse and exciting nightlife. In fact, every major city in the country has a number of nightlife activity hubs with restaurants, cafes, bars, clubs and karaoke bars, to name a few. Makati, for instance, is one of the famous venues to hang out at night. Some of the popular venues include Greenbelt, Glorietta, Jupiter Street and J.P. Rizal Street, which guarantees a night of fun and entertainment. Outside the city of Makati, tourists may choose to try the nightlife hubs of Manila in the areas of Malate and in the newly revitalized Roxas Boulevard also known as the Baywalk area. Quezon City, along Timog, Tomas Morato Avenue and Quezon Boulevard is also a popular destination of locals since the clubs are close to one another making it easy to ‘bar hop’. Quezon City is also popular for the flourishing nightlife in Eastwood City, Libis. Metro Manila’s nightlife surpasses expectations with its complete lineup of exciting events, quality customer service, inexpensive beverages and sumptuous cuisines. Ayala Center, along EDSA and Ayala Avenue is the most known commercial center in the city.It contains two shopping malls, Glorietta and Greenbelt. Along the periphery of Glorietta are three department stores: SM Department Store Makati, Rustan’s, and the Landmark. Across Makati Avenue from Glorietta is Greenbelt. This is one of the most sophisticated, modern, and expensive malls in the country. Greenbelt features dozens of coffee stores and restaurants, all overlooking a well-landscaped green park at the center where a domed Catholic chapel dominates the skyline. There are two major stores to find the best souvenirs as gift items. This first one is Kultura. It is the largest Filipino lifestyle retail chain in the country offering a definitive shopping experience for Philippine culture and crafts. It is located in major mall outlets – SM Megamall, SM Makati Annex, SM Mall of Asia, SM North Edsa. The other one is Balikbayan. Balikbayan Handicrafts strives to maintain the good name it has built for product quality and dependable service but at the same time it is more expensive as compared to Kultura. Products are made from wood, shell, fiber, paper, bamboo, vines, resin, leaves, metal, clay, and other indigenous materials are the best to find in here. The 2 big stores are located in Makati City and Pasay City.